WIPs -- or work-in-process projects -- whatever you wanna call 'em, I hate them. Don't get me wrong. I love the activity of crocheting (and knitting). I just hate the pieces parts of partially-finished projects that pile up here and there. This time of year, I have more WIPs than usual. I'm working on special orders, a contest entry or two, and oh -- don't forget Christmas presents. Looking at my kitchen counter this morning, I decided I need to clean up a few of my WIPs pronto. 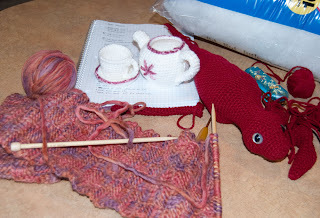 I've got a dragon (special order), a tea set (my own special adventure), and a scarf -- and that's just what hasn't been put away in the craft room! The tea set is so pretty! Is it your own pattern or one from somewhere else? Heh heh. You guys know me too well. 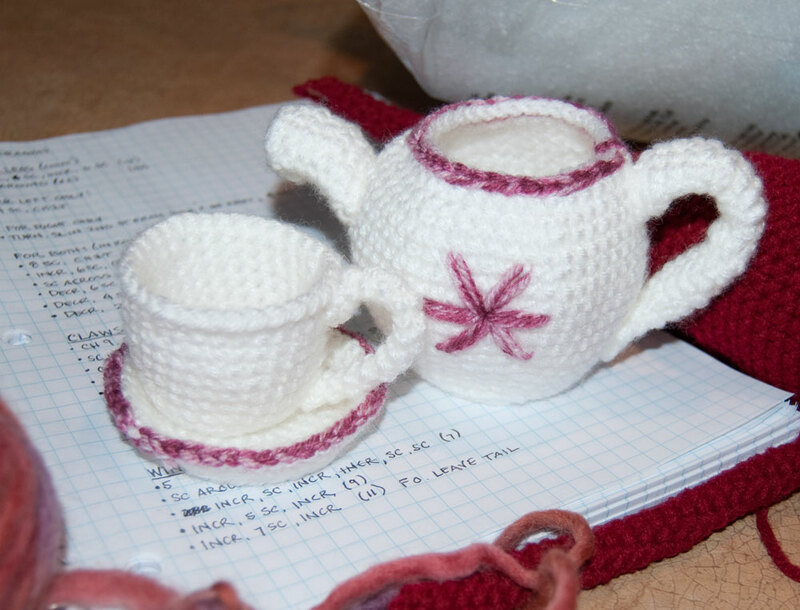 The tea set IS for a future pattern -- although I most likely won't have it done before the end of the year. It's actually a pretty detailed set and includes a sugar bowl, creamer, and dessert plate :-) But I will keep you posted on the progress! Oh my gosh, that tea set is adorable! I guess you have to know my love of all things tea. LOL I can't wait to see it completed.